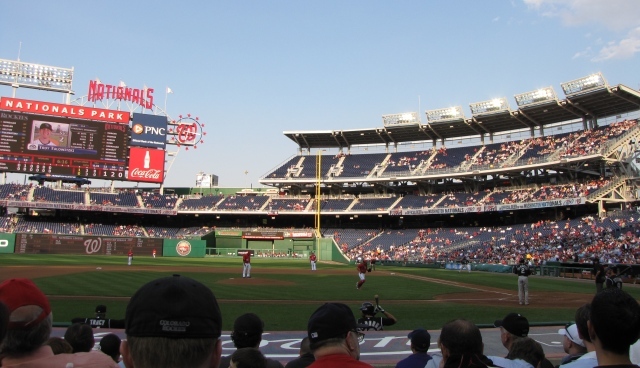 Yes, today’s Nats game against the Tribe was Strasburg’s second start, so that was a big deal. I’ll go over that in a second. I first want to point out how sweet the jerseys were in today’s game in Cleveland. Now that that’s out of the way, I’ll begin with the end: The Nationals cruised to a 9-4 curly W and Strasburg’s final line was 5.1 IP, 2 H, 1 R, 5 BB, 8 SO, 1 HR. He was taken out in the sixth for a number of reasons. Another reason is Strasburg had just loaded the bases by giving up a single and two walks. The walks weren’t close calls on the corners either, he was just missing. Probably due in part to the third reason. The final reason (at least to this layman) was that there was a problem with the mound. Bob Carpenter and Rob Dibble said it was because of the humidity and the heat and the sun and yadda yadda. Both pitchers seemed to be slipping when they planted their front foot because they planted in the same place and were creating a little rut. At one point between innings the grounds crew came out to fix it, and did it again shortly before Strasburg exited. So: near 100 pitches, 5 run lead, just loaded the bases, broken mound threatening to injure your franchise 21-year old. Seems like a good time to take the kid out. Let’s start with the good. 8 punch outs. An 8 pitch, 3 groundout third inning. A nice pitch to Austin Kearns in the second inning: Travis Hafner had just delivered a breaking ball over the right field wall. On the next pitch, to Kearns, Strasburg threw a changeup low in the zone that Kearns flied out to right. That changeup was a good response to the homer. I expected him to come back with heat, which I think is the typical reaction of a young guy who just got taken deep. Also, as Jayson Stark tweeted: The Stephen Strasburg Radar Gun Report: 9 pitches at 100 mph, 31 at 98 or higher, 40 at 97 or higher. That’s a lot of speeding tickets. The gas was so fast that Carpenter and Dibble admitted that they often can’t tell if they just saw a two- or four-seamer. At one point the cameraman shooting from behind first base couldn’t move the camera fast enough to keep up. Now the not-as-good. Basically the sixth inning. He started having a little control trouble, specifically with Hafner. After having served up the homer to Hafner in the second, he pitched around him a little in the fourth. Now in the sixth he noticeably pitched around him, seemingly losing control at times. That worries me a little. He can’t let a guy get to him that way. File that away in the He’s Young folder. The Nationals do have other players: Drew Storen came in to relieve Strasburg and inherited the bases loaded. Popout, strikeout. Storen has now inherited 12 runners this season, and zero of them have scored. Only one pitcher has inherited more runners without allowing any of them to score: Wilton Lopez of Houston has 14. Bet you didn’t know that one off the top of your head. On the offensive side, obviously the whole team hit well to score 9 runs. Notable is Adam Dunn who belted another no-doubter. Dunn is hitting .289 this season, 38 points higher than his .251 career average. He’s hit 4 home runs since Tuesday. His last 9 homers have all come off starters. I don’t know what that means, but it’s neat. That list includes Barry Zito, Ubaldo Jiminez, and Tim Hudson. Not bad. The Nats are off tomorrow as they travel to Detroit. Lannan against Scherzer on Tuesday should be a good matchup. Others on today’s game: Drew Silva, Tom Withers. 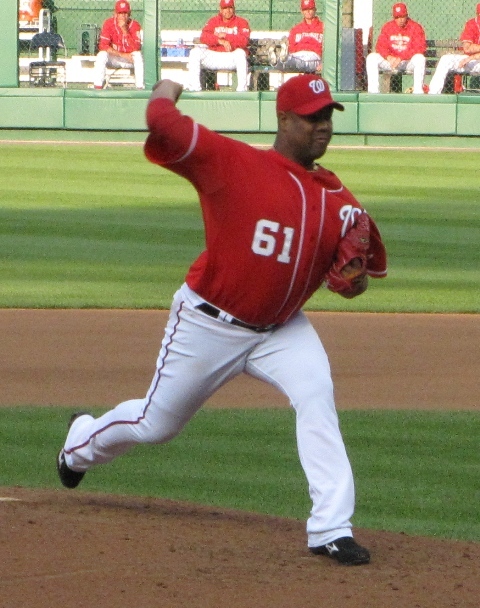 Today Ubaldo Jiminez takes on Livan Hernandez at Nationals Park. You may have heard that on Saturday Jiminez tossed a no-hitter. You probably didn’t hear that on Saturday Hernandez threw a shutout (hardly anyone here heard it – Redskins missing preseason workouts and the Caps in the postseason trump in this backwards place). I wonder when the last time was that two pitchers were starting against each other after having just thrown complete game shutouts. Even rarer, how many times has one of those shutouts been a no-hitter? I love me some Nationals but I won’t be disappointed if Ubaldo goes all Johnny Vander Meer on the home nine. I know that there are two perfectly valid responses to this but I’m going to say it anyway. * Tony LaRussa was unwise on Saturday and didn’t catch any flak for it, at least not that I saw. In the 18th inning of Saturday’s marathon against the Mets, Tony brought Felipe Lopez, a third baseman, in to pitch. In the 19th, Tony brought Joe Mather in to pitch, who had replaced Lopez at third after playing in center field previously. In the 20th, Mather lost the game. Now, when Tony brought in the position players to pitch he was out of relievers and the score was 0-0. This raises a couple questions in my mind. Sure, you don’t know how long a 0-0 tie will last, but once you’re down to two relievers I think you’d start stretching them out a little bit, right? Especially when apparently you would rather pitch a position player than pitch one of your starters, although you would stick one of your starters in left field (Tony sent Kyle Lohse out there in the 18th). I know it’s only one game, but pitching a position player is almost like giving up*, and every game counts. *Although it is the Mets and Felipe Lopez did get through his inning in 4 batters. If Jerry Manuel had pulled that move those buzzards Jersey Matt keeps mentioning would have had a field day today. Fortunately for the buzzards there are plenty of other reasons to keep an eye on Jerry. During that game on Saturday, K-Rod got up in the pen nine times and reportedly threw over 100 pitches before entering the game. He ended up blowing the save, of course, because his arm was dead dead dead. That is how you mess up the arm of your overpriced closer. That is why Jerry Manuel, as Jersey Matt promises, may not make it to Memorial Day. One last thing on the mismanagement of the Mets: they insisted they weren’t going to rush Ike Davis to the bigs. Insisted! Well, here he comes* to take Mike Jacobs’ place. I think it was generally accepted that it was going to happen eventually because Mike Jacob’s is generally not very good, but Mike Jacobs has had 24 at-bats this season. So much for not rushing. *He had two hits tonight in a win against the Cubbies. Meanwhile, the Yankees look like they’re going to win 115 games and the Red Sox look like they’re going to win 75. Of course those teams will both level out but at the moment they’re going in opposite directions. The Yankees have a +25 run differential and the Red Sox have scored 15 fewer runs than the Nationals (but 2 more than the Mets). DC is a-buzz about the Nationals’ and their blazing 7-6 start. They beat the Rockies tonight; before the game, today was the latest in the season they were at .500 since they finished 2005 81-81. They lost their last 3 games of that season, so this is the latest they’ve been above .500 since September 28, 2005, if I’m not mistaken. Hoo-rah. Pudge is hitting .450 in 40 ABs. I’m sure that will last.